I wasn’t expecting this to be published so soon after my trip. Such short articles normally get archived until some future date when there is space and a need for them…..and then they are not always published. This appeared in Cycle Magazine, national magazine of Cycling UK, with a circulation of 70,000. I don’t normally carry the technology for uploading my route maps from my GPS to my blog, so here they are. I stayed mainly in the south of the island because that is where most of the rideable roads are. Intended as a 30km warm-up ride, it turned into a 71km exploration of the south of the island. 77km taking me to two coastal holiday villages…..thankfully one of them had some services open! 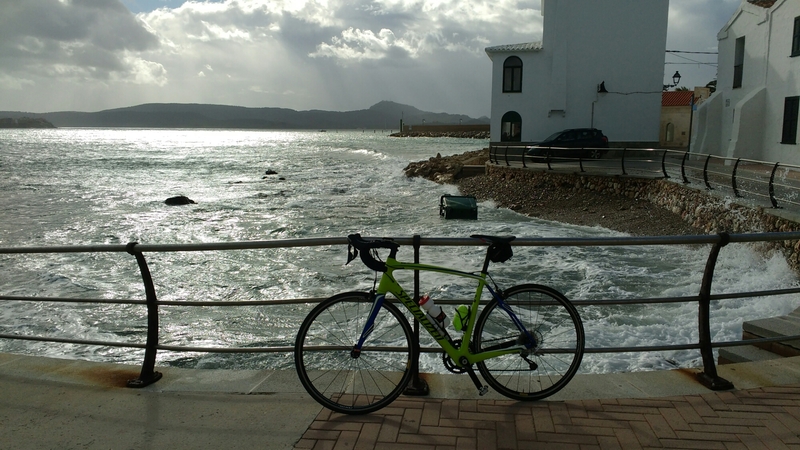 25km, my attempt to cycle the length of the island to Ciutadella was foiled by the ferocity of the weather. 91km, in search of beaches and bays that lie several kms off the main roads. Everywhere is closed up for winter. 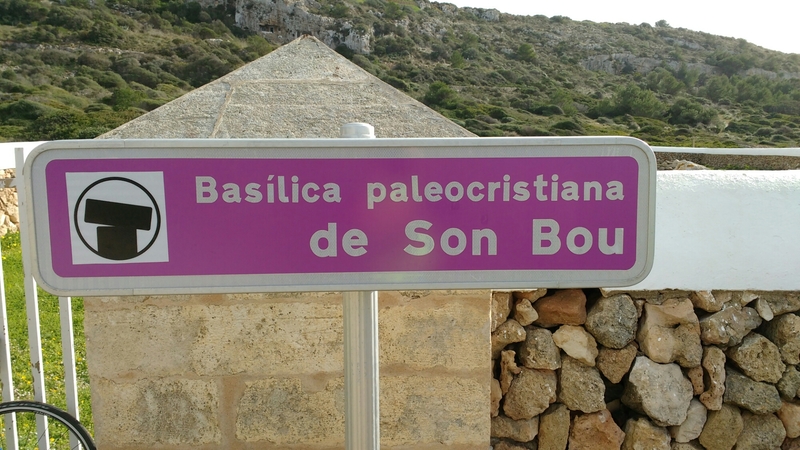 72km, a final route that included paeleo-Christian basilica and 19th century fort. When lightning strikes happen to other people, they often make exciting, intriguing, sometimes sad news. When it happens to you, or causes a major delay in your travel plans, it then becomes an ‘adventure’ a bit too close to home. No, I wasn’t struck by lightning, I am very happy to say, but my Monarch flight was struck as it approached Menorca airport with its contingent of British passengers. Menorca airport is a small place and, in winter time, works on minimal staffing. The 200 passengers waiting to board were sent emails every half hour informing them of the revised departure time. After three hours, the captain felt obliged to address the restless mob, explaining that they had detected some damage to the electrics, and were awaiting instructions from Airbus about the safety of resuming their journey. 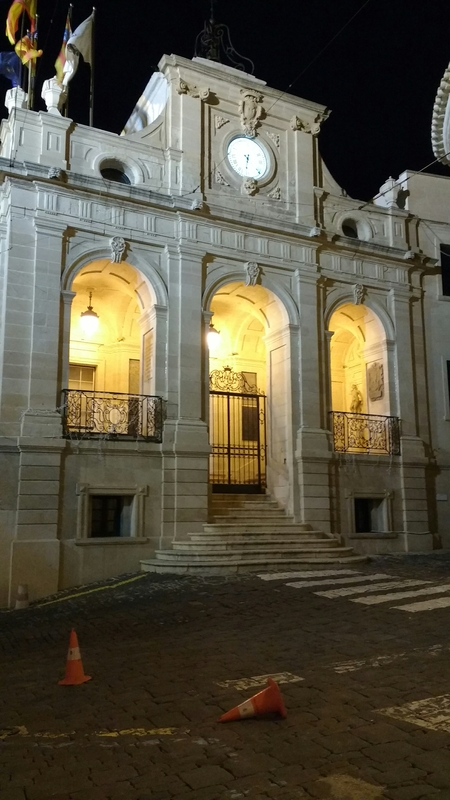 He also added that he and his crew were rapidly running out of legal shift time, after which they would have to take compulsory rest……..which would mean having a stop-over in Menorca. Now Monarch, like most budget airlines, do not have the financial capacity for keeping aircraft on stand-by in the case of such events, so no substitute plane was going to be sent out. We simply had to sit it out and hope for the best. After nearly 8 hours, they allowed us to board where we sat for another 40 minutes waiting for the engineers to sign off the safety check, and I am happy to report that the flight home was uneventful. The ‘huge concession’ made by Monarch was to award each of the passenger with a 6 euro snack…. So, instead of arriving in Gatwick at 14.20, we arrived at 22.00, missing my National Express connection by over 6 hours, meaning I had to buy an expensive train ticket to get home, eventually arriving home at 01.30am. I, like probably most of my fellow passengers, began searching for the small print concerning delays and added expense, and discovered a clause in the company’s T&Cs that Monarch airlines will not be liable if the delay is caused by ‘extraordinary circumstances’. The big question now is: were the complications caused by a lightning strike ‘extraordinary circumstances’? I began to investigate……..and this is what I found. In January 2016, a judge at Luton County Court, deliberating on a similar case against Monarch, decided that lightning strikes do not constitute ‘extraordinary circumstances’, presumably because they are so commonplace that airline companies should have in place the resources to respond to them. In other words, the simple solution would have been for Monarch to either send out another plane to pick us up, or contract the loan of another aircraft from a nearby airport (like Mallorca or Barcelona, for instance). But they didn’t do that. They made us wait 8 hours, instead, to avoid this major expense to the company, making it clear to us that company profits are of greater importance than the convenience and wellbeing of 200 passengers. If Monarch have to proceed to pay-outs, they could be liable to 600 euros per passenger. So, I have filed my claim (principally for the cost of a train ticket), and now await a response. Stay tuned………. As I set off to explore the few roads left to be discovered on the island, I heard that Alicante had its first snow in 35 years, and Ronda (in Andalucia) had its first snow in 60 years! Records are being broken everywhere, and news bulletins are letting the extraordinary weather events to even upstage Donald Trump’s inauguration tomorrow. As cold as Menorca has been in the last week, at least we haven’t seen any of the white stuff. Whereas over in Mallorca, there have been dramatic pictures of Sky continuing to train despite heavy snowfall. Commitment to earning their salaries, perhaps. (a town established by the French during the few years they had arrested control of the island from the British), and eventually out along the long peninsula where an 19th century fort had been built to protect the harbour from invasion. Sadly closed for the winter, so had to admire it from afar. 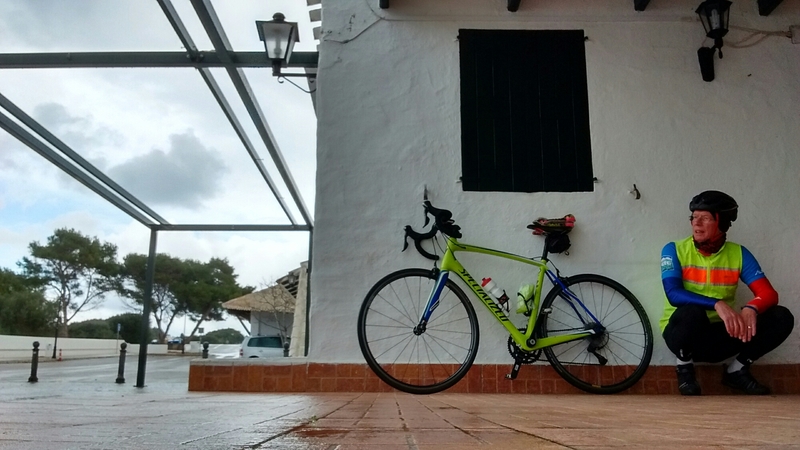 Despite the challenging weather conditions, atypical for this time of the year, Menorca makes a good destination for cyclists like me, who want to combine cycling the miles with discovering the environment and its history. For the out-and-out sports cyclist, intent only on putting in the miles, it has its limitations. 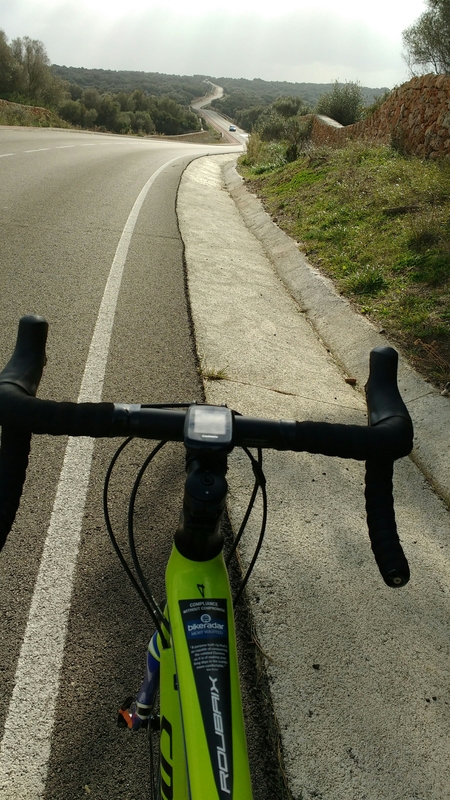 It is too small to provide the variety of terrain and routes so necessary for a roadie in training. If you are an off-roader, on the other hand, the island has much more to offer. Ah bliss…..the freedom of the open road once again. Cold temperatures were forecast, as were strong winds with gusts of up to 80km per hour, but the potential of a dry day (according to the BBC weather app, anyway), so I set off into the wind with a degree of optimism. 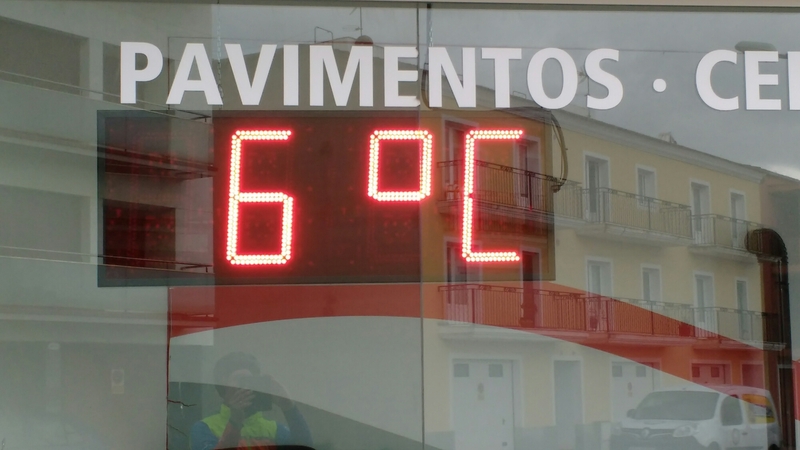 But whatever the street thermometers tell you about air temperature, when the winds blow down from Siberia, 6C really feels like 0C, or what the Spaniards refer to as the thermic temperature. I headed for one of the many coastal holiday villages called Sol Parc, knowing it would be a winter ghost town like all such communities, but I had been assured by a fellow flight passenger that it had a bar open in the winter months. So off I went. When I eventually found this mysterious bar, run by an English lady, and met the only customer (an elderly gentleman who seemed to be living the life of a hermit, his only companion being his dog), I struggled to visualise the attraction of living in such a place year-round. 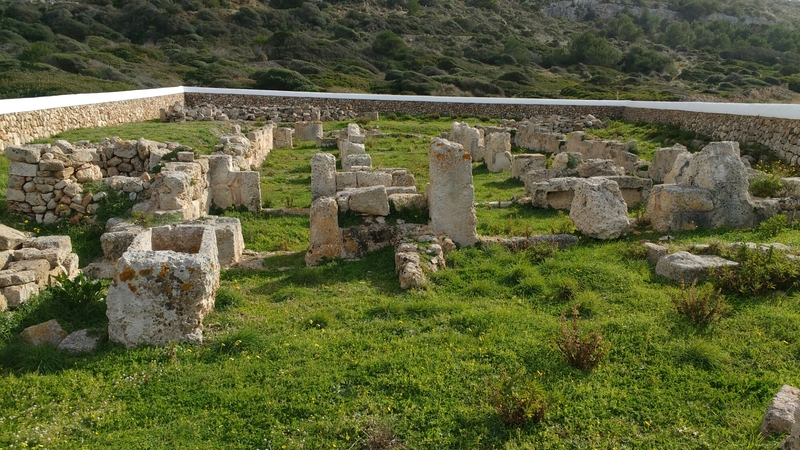 Menorca is desperately trying to make the island a year-round holiday destination (like Mallorca), promoting outdoor activities and culture for the winter months, but they will have to do something to inject a bit of life into these coastal ghost towns if they are to succeed. with the uncovered remains of an ancient paleolithic basilica, built after the Roman occupation, and before the arrival of the Moors. I tell you, this little island has seen some history. And as I swung round from viewing the ancient remains, I was only this far from stepping onto a beach and gazing out over the horizon. Over a late leisurely lunch in a harbour-side restaurant in Mahon, I met a young English family who were preparing to up-sticks in Dubai and move permanently to Menorca. In fact they had only just clinched the deal on their new house, and they were both nervous and excited about the prospects. 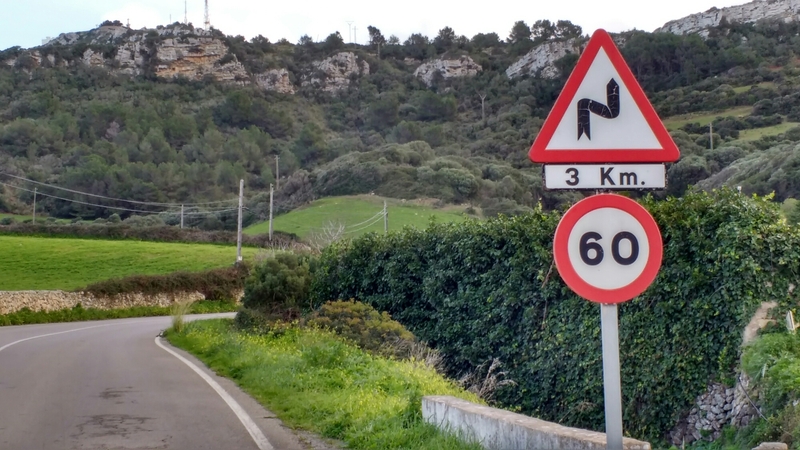 Having just experienced the coldest week in Menorca for over 10 years, at least they were making their decision when Menorca wasn’t exactly selling itself. We were spared the heavy snow experienced by neighbouring Mallorca, and even further south in Alicante, but the freezing winds whistling down from Siberia had me skulking under 7 layers of clothing, as I climbed on a smart-looking bus to Ciutadella at the other end of the island. Even though it’s not the capital, it is bigger than Mahon, and had been the capital until the arrival of the British. 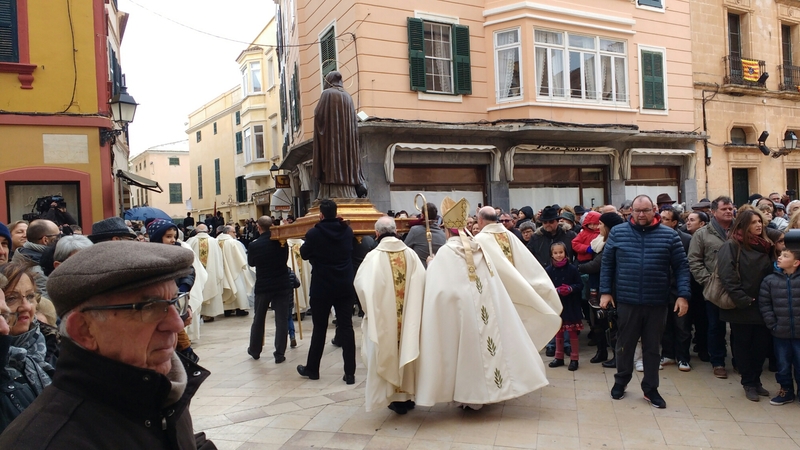 Today, embedded in their patronal festivities, was a re-enactment of a very important moment in the history of the island…..and this time, I’m not referring to the arrival of the British! 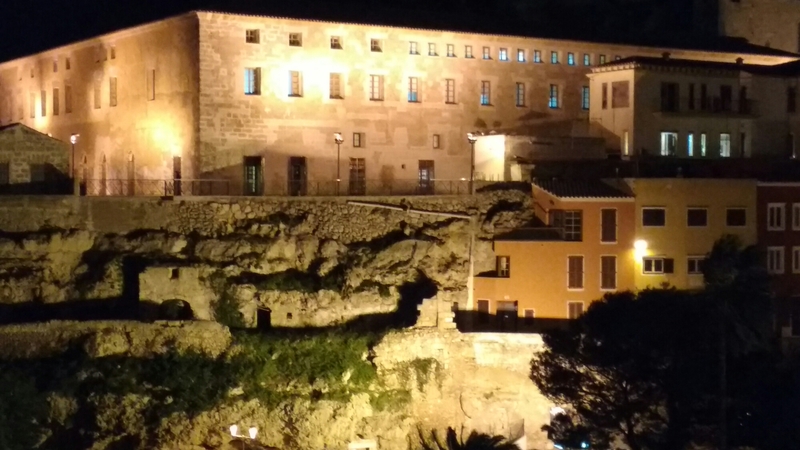 ceremoniously knocked three times on the city gate, and entered to begin the long process of re-Christianizing the island……and establishing a dialect of Catalan as the official language. 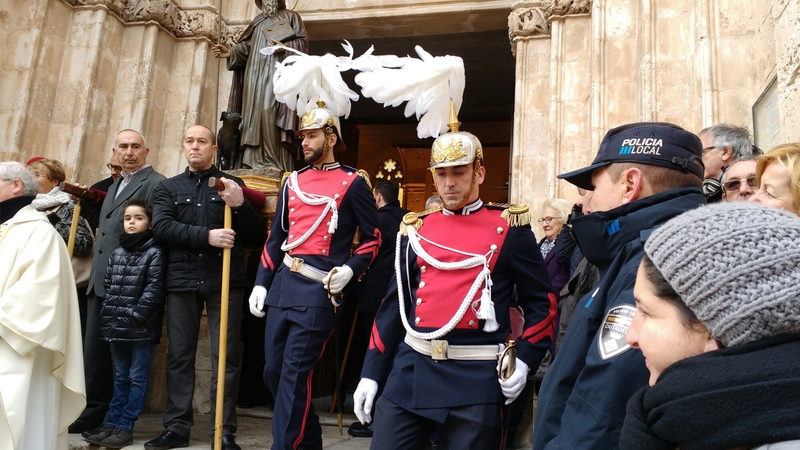 A formal choral mass is led by the Bishop in the Cathedral, followed by a procession through the streets led by mounted dignitaries, until they arrive at the Plaza de Alfonso lll, where the ceremonial knocking at the gate is re-enacted to the cheering and applause of the crowd. Then everyone disperses to have a party…..I mean, what else is there to do on a freezing Siberian winter day…..? Trussed up like a turkey: this is what you get to look like when the forecast tells you the weather gods are going to throw everything at you…..rain, hail, gale-force winds, with temperatures just hovering above freezing. The smile for the camera was completely erased an hour later when I had to throw in the towel and turn back to basecamp. 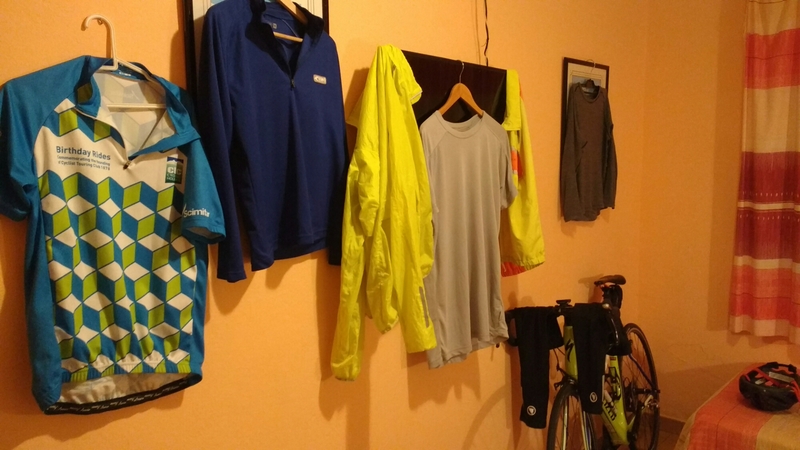 I rode back through patches of settled hail stones, and had to peel off the several sodden layers one by one before jumping into a blissfully hot shower. My room now looks like a Chinese laundry. 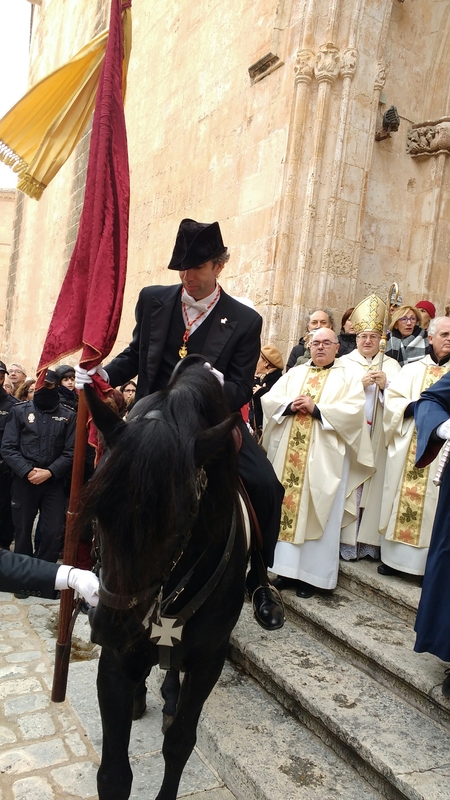 Because the Siberian weather front is set to intensify tomorrow, with the rarely experienced possibility of snow falling on Menorca, even the patronal fiesta activities have been postponed for two weeks. San Antoni, normally celebrated on the 17th, is just going to have to wait (sorry mate!). Most of the historic centre was built by the British in the 18th century, so the predominant architectural style is Georgian, but British touches were also added to already existing buildings, like the clock on this 17th century masterpiece. And one other curious reminder of the British presence is the continued use of adopted words: grevi (gravy); winder (window); botil (bottle); mervel (marble); xoc (chalk), to name just a few. And when I say the British occupied Menorca, what I really mean is they captured it and occupied it three times. There was quite a bit of squabbling going on with France, then with Spain, and finally with Austria. Then they all came to a gentleman’s agreement (meaning the British won the fight to leave behind gin-drinking and cricket as their inheritance) and handed it over to Spain…..and everyone lived happily ever after. Food is seldom far from a cyclist’s thoughts. 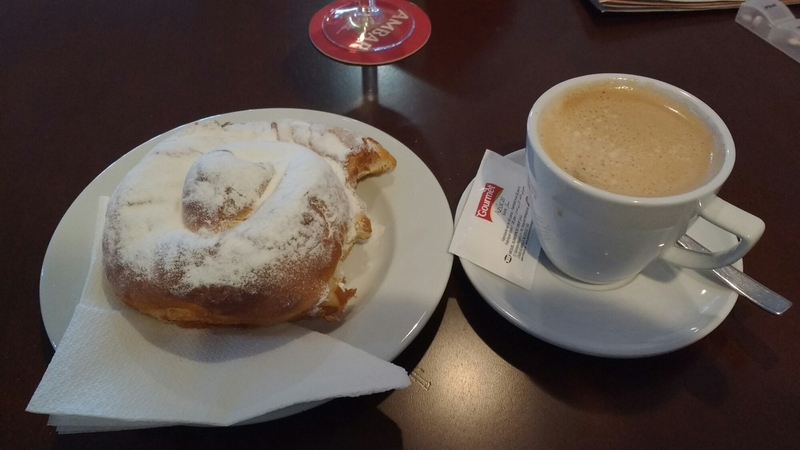 A day’s ride is predictably punctuated by calorie-loading stops, but here in Menorca, I begin the day with a local breakfast delicacy: the famous ensaimada. A yeast-based pastry made with fortified flour, light to eat but surprisingly filling. One is good enough to take me 30kms…..And they taste nice, too! taking the punishment of the headwind while the legs were fresh, with the prospect, of course, of coasting back home at the end of the day. 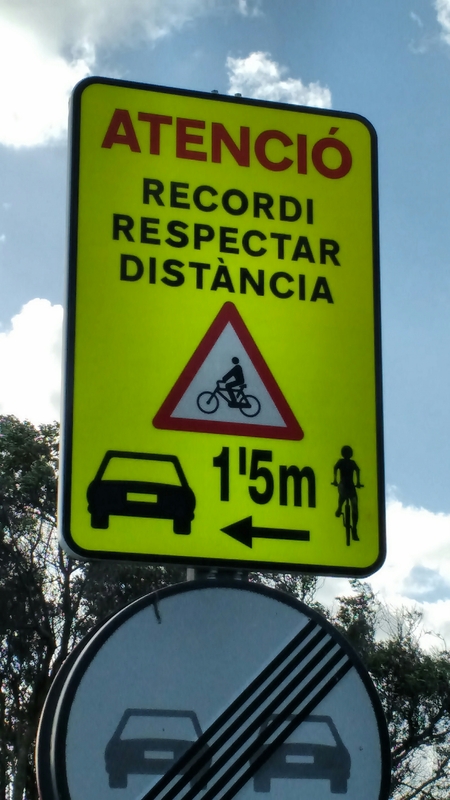 When conditions out on the open roads are tough, it is nice to know that the Spanish Ministry of Transport has the safety of cyclists at heart…..
and, amazingly, most motorists do observe the 1.5 metre rule, patiently trailing behind me until they can overtake safely, allowing me the stipulated safety margin. I am impressed. And despite the strong winds, cyclists were out across the island doing their weekend miles, especially racing clubs, who frequently left me behind to eat their dust….. But as I whizzed through (wind behind me, of course) Es Mercadal again this afternoon, I was treated to one of those serendipities that halt you in your tracks. Carried by the wind, I heard the familiar drum rolls of a drumming band, so I followed the sound to the main plaza, and chanced upon two bands practising for the patronal fiesta on Tuesday. They were surrounded by a growing audience, flashmob-style, and kept us entranced by the complex rhythms of their repertoires. 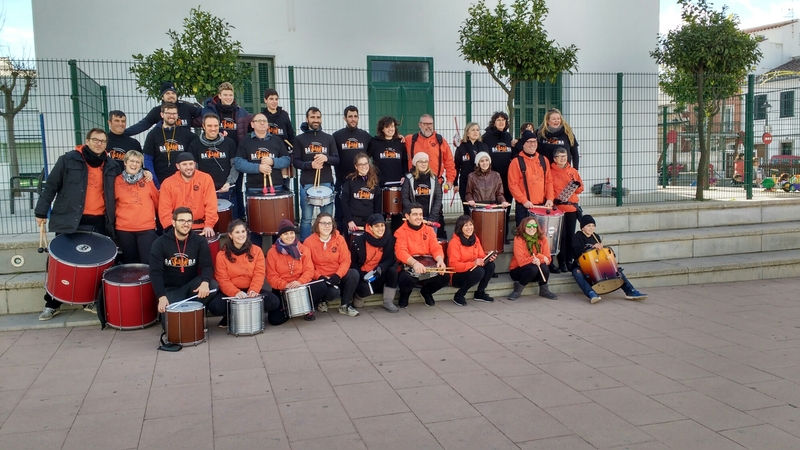 The most impressive display of drumming I’ve ever witnessed was the famous Holy Week gathering of 1000 drummers in Calanda in Aragon. At the stroke of 12 on Good Friday, the surrounding buildings began to vibrate with the sheer decibel level of the outburst. Today’s 20 drummers re-ignited that memory for me. When I got back to Mahon, I was annoyingly waylaid by a Galician restaurant that beckoned me inside to sample their empanadas and padron peppers. Life can be so difficult to manage at times……. 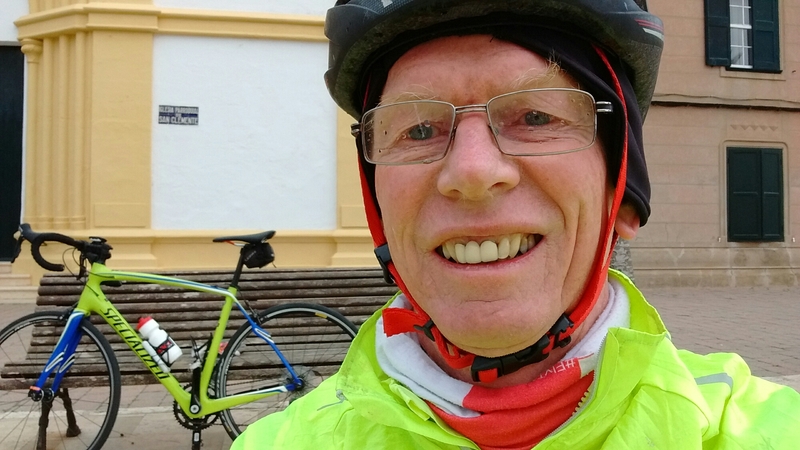 at a winter discount price, headed out beneath a threatening sky and against a very cold 20kms head wind, and decided to do just 30-40kms locally to get used to the bike, and have a quick route of escape back to base in case the weather turned nasty…… and what happened? I got into my stride, the bike felt good, I felt good, the weather didn’t turn brutal, and what should have been an amble round bays and through villages turned into a moderately long day ride. One day I will accept that I can’t simply do ‘ambles’, because ambles are rides without purpose. For me, a ride with purpose requires two ingredients: a destination and a distance, and you begin the ride with both as given, because at the end there is a sense of completion and achievement. 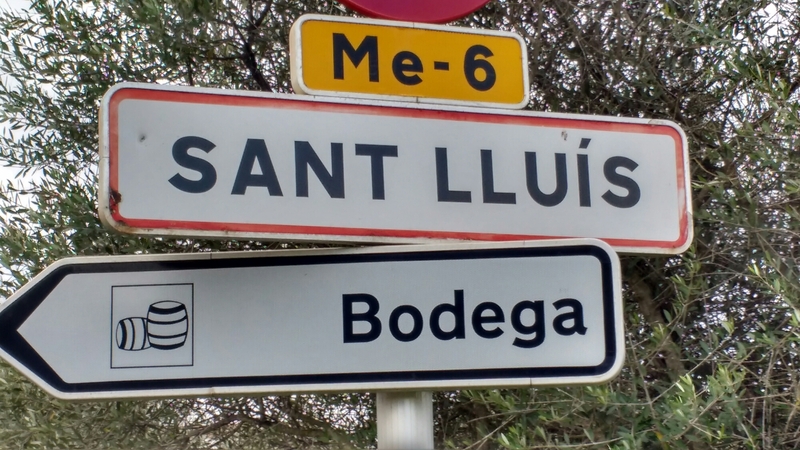 I began the ‘amble’ bit of the ride exploring villages in the south, stopping for a much needed hot coffee in Sant Lluis (the wind chill had really got to me), then got the bit between the teeth and motored north to Es Mercadal, to the foot of the infamous climb to El Toro. When you see an innocent little sign like this, there is nothing innocent about it. 3kms of bends in the road usually mean only one thing: a big climb with severe switchbacks. In this ‘post-truth age’ I won’t make any claims about my performance, because you’ll probably guess the real truth anyway. 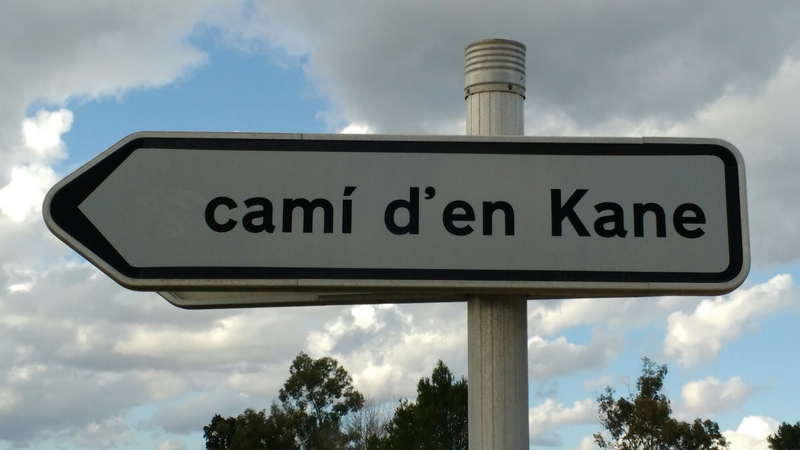 And after following this winding country road for 25kms, I discovered that Kane was one of the British Governors of the island in the 18th century. He had had this road built to link the capital, Mahon, with the north of the island. You see, doing ‘research’from the saddle of a bike is easy. Not to mention the bronze age megaliths that kept delaying my progress…..but don’t let me bore you with that. I tap out this post on my phone accompanied by tv images of critical weather conditions across Spain. Mercifully, Menorca is not going to have the snow and sub-zero temperatures of the mainland, but it is going to be cold and wet for the next 4-5 days….. whoopee! 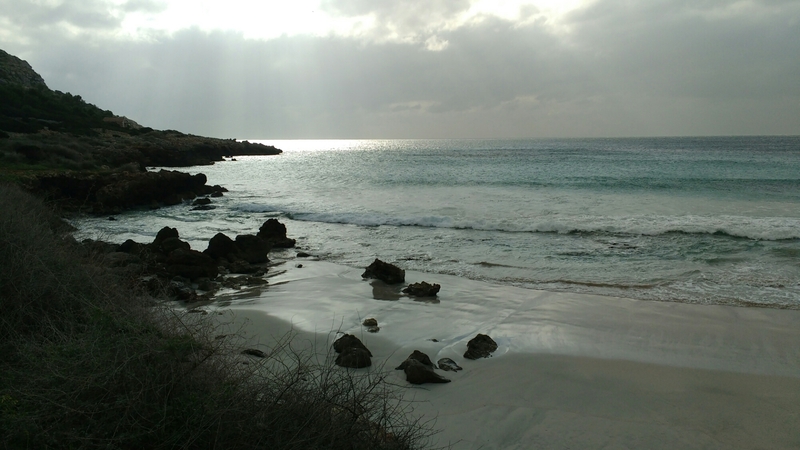 Unlike the Canary Isles, the Balearics do have a proper winter, but one which is usually mild and sunny…. but not always. In other words, if you come to enjoy out-of-season sport, you take your chances, just as I am this week. 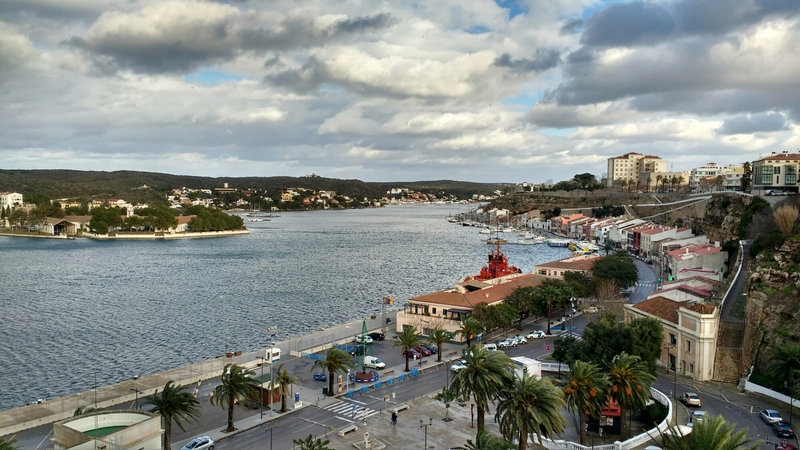 And because Menorca has a proper winter, most of the island is in winter-mode, with minimal services, and many bars and restaurants closed. Perfect if you prefer to avoid the crowds, but disastrous if you like nightlife and the buzz of human activity. 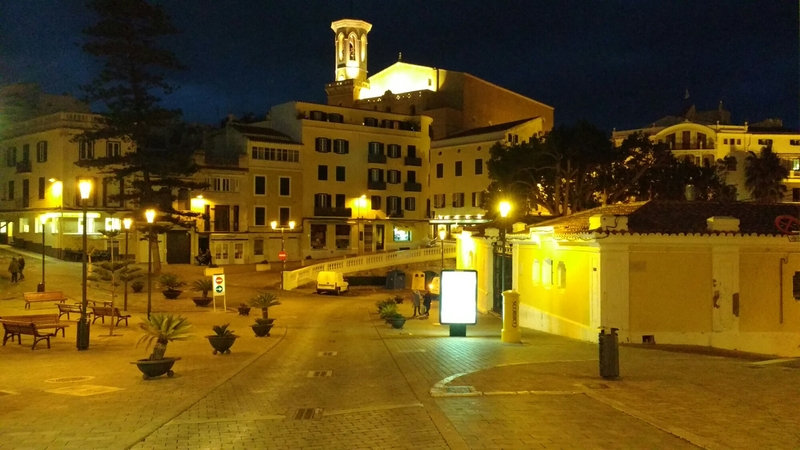 Menorca in January slumbers like a hibernating bear. And my UK friends mustn’t imagine that we are the only country suffering from a crisis in our health services. 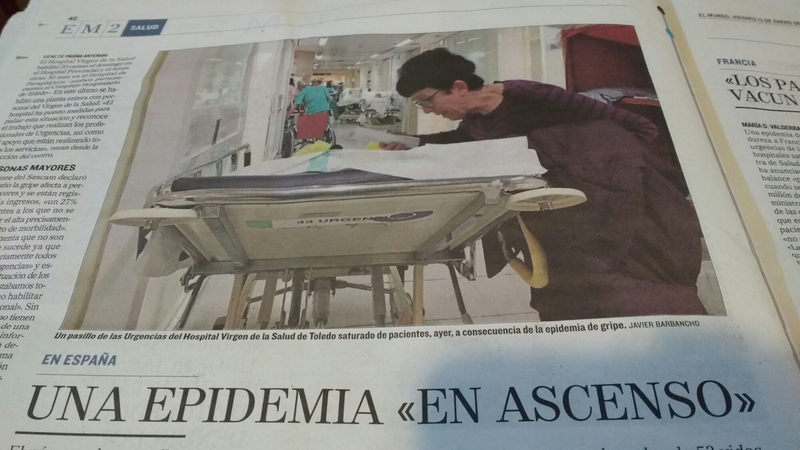 Spain is reeling from a flu epidemic, people are dying, and the hospitals are in crisis. Here too, patients on trolleys are lining the corridors, and some of this has been caused by a somewhat less than enthusiastic autumn campaign to have the most vulnerable vaccinated. My quest to cycle most of the major islands of the Mediterranean continues apace tomorrow, as I set off for the small island of Menorca, lying to the north east of Mallorca. 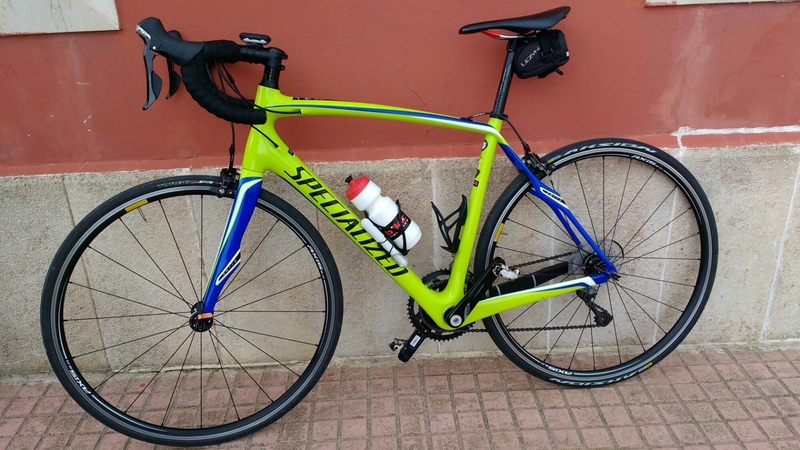 I have already cycled Mallorca a couple of times, always off-season, and Ibiza and Formentera. Further to the east, I have spent a week each on both Sicily and Cyprus, but still in my sights are islands like Sardinia, Corsica, Crete and Rhodes. 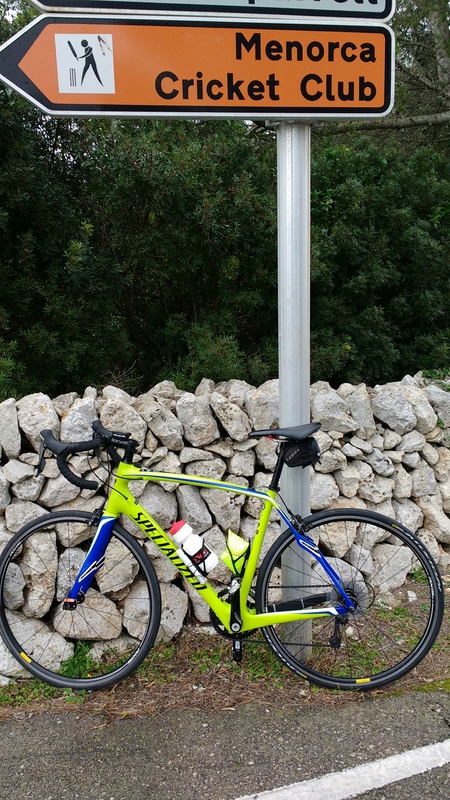 I have visited Malta as a tourist, and the size of the island and the density of both population and traffic make it a poor destination for a cyclist like me. Menorca, however, holds a lot of mysteries. It is small and basically has just one road that straddles the entire length of the island, about 50kms long. From this central spine, several local roads and tracks lead down to bays and beaches, all waiting to be explored. 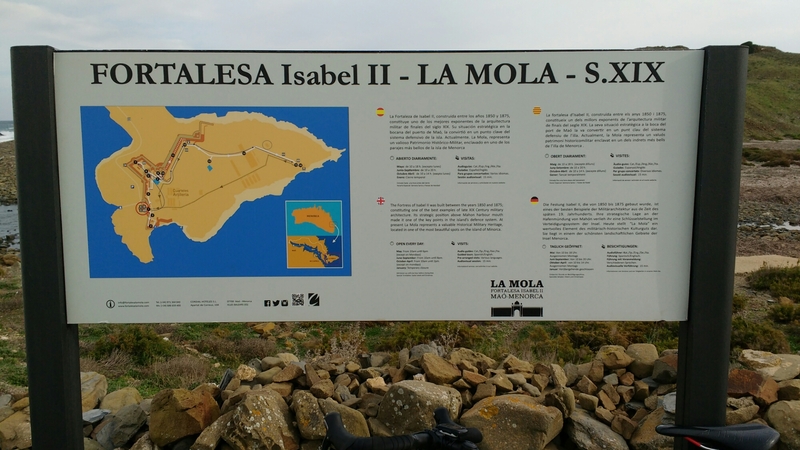 Around the entire island there is a bridleway, Cami des Cavalls, established by the British in the 18th century when they occupied the island for over 60 years. This route around the island was used by British coastguards (on horseback) to look out for invading forces. The last remaining gin distillery is a lasting testament of the British presence, but much remains to be discovered in order to unearth other nuggets of information about the history of the British on the island.